THE family of a patient who sadly passed away have made a special donation to help make a real difference to patients. 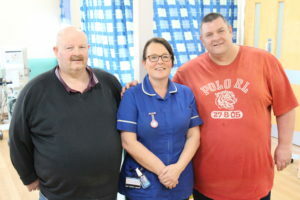 When planning his funeral, Ray Cummins decided that in lieu of any flowers of gifts, he wanted people to donate funds for the medical day unit at the University Hospital of North Tees. This money went towards buying a fridge and a CD player for the unit – to be used by patients who wanted to use it for food and drink. Ray, 83 and from Hartlepool, visited the unit regularly to have an abdominal drain procedure. Donna Enisz, liver specialist nurse at North Tees and Hartlepool NHS Foundation Trust, said: “Ray visited the unit every few weeks, he was a really lovely man. “Like many of the patients, he could spend several hours in the unit at any one time and would sometimes bring something to drink and eat while he was here. There was a real need to have a fridge for patients in the unit. Ray’s two sons, Gary and Les, visited the unit recently to meet with staff.